Akin to the human spirit and passions. Common motif in Buddhist art & literature. INDIA AND CHINA - MONKEY LORE. Monkey mythology is an important part of both Hindu/Buddhist lore (India) and Zodiac/Taoist/Buddhist lore (China). In the various tales presented below, the monkey is portrayed initially as foolish, vain, and mischievous. Yet, in each tradition, the monkey learns valuable lessons along the way, makes changes, and eventually gains redemption. 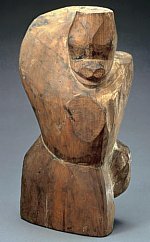 The monkey thus embodies the themes of repentance, responsibility, devotion, and the promise of salvation to all who sincerely seek it. This symbolism is still common in Buddhism as practiced today. In modern meditation practices in many Buddhist sects, one must first subdue the “monkey mind” before meditation can yield results. 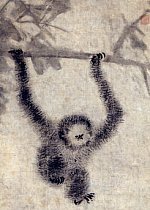 The goal is to overcome the restless monkey mindset, to stop jumping from branch to branch, to stop grabbing whatever fruit comes into sight, to stop being fooled by mere appearances. Salvation is within the grasp of all who seek it if they remain true, sincere, and dedicated. The Sanskrit term Vanara means monkey or forest dweller. Other Sanskrit terms for monkey include Makata and Kapi. In India, the most widely known Vanara is Hanuman, the monkey warrior who appears in the epic Hindu tale Ramayana (5th to 4th century BCE). Even today, Hanuman is a very popular village god in southern, central and northern India, and artwork of Hanuman can still be found easily in India and other nations in Southeast Asia. Hanuman is a manifestation (avatar) of the Hindu god Śiva. In one version of the story, Śiva and Parvati (“daughter of the mountain”) transform themselves into monkeys and are playing amorous games in the forest when Hanuman is conceived. Since their union took place while in monkey form, Śiva realizes his child will be simian, and instructs Vayu (the wind god) to deposit the gestating seed into the womb of a female monkey named Anjana. Anjana was originally a celestial maiden (apsara) named Punjisthala, but a curse had transformed her into a monkey. Vayu possesses Anjana, with her consent, and she gives birth to Hanuman. Hanuman is thus also called Maruti (son of the wind) and Anjaneya (son of Anjana). Ramayana. The Ramayana epic is generally placed sometime between the 5th and 2nd centuries BC. Based in part on fact and folklore from earlier centuries, it contains the teachings of ancient Hindu sages, devotional text, narrative allegory, and philosophic discourse. Monkey lore plays a prominent role in the early years of Buddhism in India. Among hundreds of tales in the Jataka -- perhaps the oldest extant collection of Buddhist folklore originating in India and Sri Lanka around the 3rd century BC -- the Historical Buddha was said to have lived many prior lives in many different forms before attaining enlightenment. 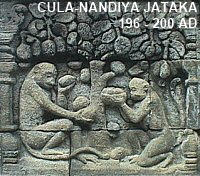 In the Jataka tales, he appears often in the form of a monkey (e.g., Nandiya), as other animals, as a human, and even as a god. But throughout, he practices generosity, courage, justice, and patience until finally achieving Buddhahood. The Pali Jatakas record 123 past lives as an animal, 357 as a human, and 66 as a god. Devadatta, a cousin of the Historical Buddha, also appears in the various Jataka stories in multiple incarnations, typically as the villain. 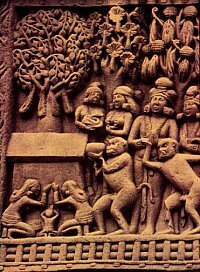 Monkeys offering honey to the Buddha (not shown, his presence implied by the platform beneath a bodhi-tree). Such carvings predate any extant written texts. Carved in the sandstone railings, crossbeams, and in gateways of reliquary stupas at places like Bharhut and Sanchi, these early Buddhist carvings from India consistently avoid depiction of the Buddha in human form. In other artwork, the monkey is shown dancing in joy when the meditating Buddha accepts the monkey’s offering of a bowl of honey. In one of his past lives, before attaining Buddhahood, the Historial Buddha was a wise monkey king who enabled his followers to escape from hunters. 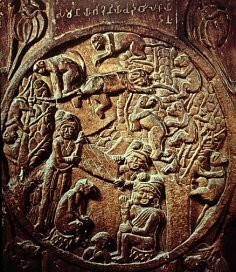 Here we see a depiction of the "Mahakapi Jataka," in which the future Buddha is a compassionate leader of a troop of monkeys who escape across a river on his back; carved on a stupa railing pillar at Bharhut, c. 150 BC; India Museum, Calcutta. Read this story by clicking here (outside link). Another excellent version of this story is found here (outside link). 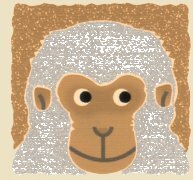 In this story, the monkey embodies the virtue of generosity. The story of Kapinjala is a popular Jataka tale. The story tells of four animals living in the forest -- a hare, a monkey, a type of bird called Kapinjala, and an elephant. They choose the Kapinjala as their chief and live in harmony and mutual respect. 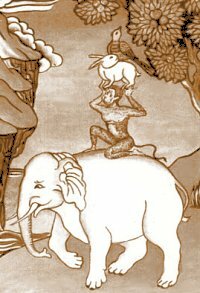 The Kapinjala represents Shakyamuni (Historical Buddha), the hare Sariputra, the monkey personifies Buddha’s disciple Maudgalyayana (outside link), and the elephant Ananda. Read the story here. A king who was a devout follower of Kashyapa Buddha (the sixth of seven Buddhas of the past, the last being the Historical Buddha). In the sutra named “Protection of the Sovereign of the Nation” (守護國界主陀羅尼經, Shugo Kokkaishu Darani Kyou), King Kriki has troubling dreams and asks Kashyapa Buddha for an interpretation. One of the king’s dreams involved ten monkeys, who lived together in a group. Nine of them harassed people in the city by stealing their food and drink. The tenth refused to join them and contented himself with what little he had. For this, the other nine monkeys ostracized him. Kashyapa Buddha says the dream represents the conditions of the Buddhist world that will prevail following the death of the Historical Buddha. The ten monkeys represent ten kinds of monks; the ostracized one who has little desire and knows satisfaction represents the true follower, the seeker of the Dharma (Buddhist Law). The other nine monks, represented by the nine greedy monkeys, will slander the true monk when addressing the ruler and ministers of state. They will accuse the true monk of performing evil acts and violating the precepts. As a result, the ruler will banish that monk, and the teachings of the Historical Buddha will then be lost. These monks have nine different ulterior motives, such as the desire for fame and profit. 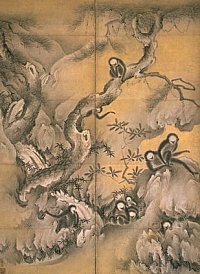 Saicho, the founder of Tendai Buddhism in Japan (see page three) makes reference to the nine bad monkeys chasing away the one good monkey in his Kenkairon Engi (early 9th century AD). The monkey, moreover, is closely associated with the Tendai Shinto-Buddhist multiplex that Saicho established on Mt. Hiei. The monkey appears often in pre-Buddhist and post-Buddhist China. In Western nations, the monkey is perhaps known most widely as the 9th animal among 12 in the Chinese Zodiac. Most scholars believe the Chinese zodiac originated sometime before 1100 BC, centuries prior to the Historical Buddha’s birth in India around 500 BC. When Buddhism was introduced to Japan in the 6th century AD, the Japanese eagerly imported both the Buddhist teachings and the zodiac calendar, the latter known as Kanshi or Eto (干支 | えと) in Japanese. In Japan, the Zodiac’s 60-year cycle (sexagenary cycle) was adopted in 604 AD by Empress Suiko, and is known as Jikkan Junishi 十干十二支 (literally “10 stems and 12 branches”). The current cycle started in 1984 AD. For full details, please see the Zodiac page. On Page Three of this report, we focus on monkey days of great misfortune known in Japan as Koushin days 庚申 (Ch: keng-shen or geng-shen). They occur six times yearly, and once every 60 years (the 57th year of the cycle). Special rites -- influenced greatly by Chinese Taoist and Zodiac beliefs from the post-Buddhist period -- are performed on these days and on the 57th year (the Koushin Year) to ward off evil influences. One of the main players is the monkey, for the term Koushin 庚申 is comprised of two characters -- KOU 庚, the Zodiac stem associated with metal and the planet Venus, and SHIN 申, the ninth branch symbol of the Chinese zodiac and the character for “monkey.” In Taoist traditions based on the Zodiac calendar, on the eve of a Koushin Day, three worms (三蟲) believed to dwell in the human body escape from the body and visit the Court of Heaven to report on the sleeping person's sins. Depending on this report, the court might shorten that individual's life. To prevent this, people stayed awake all night on Koushin eve, and this practice eventually became known as the Koushin Machi (Koushin Vigil, Koushin Wake, 庚申會). Such beliefs were recorded by the late Heian era, but became particularly widespread during Japan's Edo period (1600-1868 AD), when people regularly tried to determine auspicious or inauspicious times before beginning activities (such as a new business or marriage). <This paragraph adapted in part from the Japan Now Magazine (Jan. 1996); see full story at the Asian Studies Network Information Center.> A complete bibliography of this site’s monkey resources is presented on Page Four. 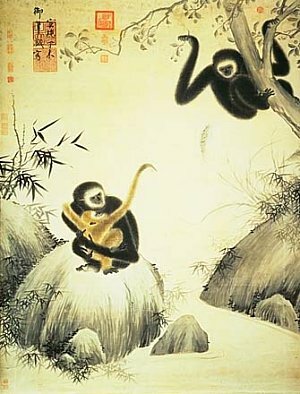 The Chinese story named Yuanhou Zhuyue (Japanese = Enkou Sokugetsu, 猿猴捉月) tells of a group of monkeys who attempt to catch the moon’s reflection, but all are drowned in the effort. This parable, presented below, is hard to date. Buddhism was introduced to China in the 1st and 2nd centuries AD, and this parable probably originated during this time or soon thereafter. But I am unsure -- it may have originated earlier, but no later than the 8th century AD. One night a monkey chieftain saw the bright reflection of the moon in the water below his tree. Thinking that the moon had died and fallen into the water, and fearing that the world would thus slip into darkness, the monkey called together his underlings and commanded them to join tails and together pull the moon out of the water. However, when the monkeys attempted this task, their combined weight was too great, the branch broke, and they fell into the water and drowned. Journey to the West is a famous Chinese story (called Hsi-Yu Chi in Chinese). Although compiled by Wu Cheng'en in the 16th century, the legend existed long before that. It is based on a real person named Xuan Zang (602-664 AD), a Buddhist monk who journeyed to India in search of Buddhist sutras. Protecting him on his journey, in the book, are three companions: (1) the monkey named Sun Wu Kong; (2) the pig; and (3) Sandy, the Water Demon (Jp. = Sagojou). Sandy is considered, by some, to be the origin of the Japanese water sprite named Kappa. Journey to the West tells of the monkey’s revolt against Heaven, of its defeat by the Buddha, of its being cast out of heaven, and then, how it redeems itself and gains immortality by helping the monk Xuan Zang on his pilgrimage to India in search of Buddhist scriptures. The first abridged English translation of this story, by Arthur Waley, was published in 1942, and was entitled Monkey: A Folk-Tale of China. Waley translated only 30 of the 100 chapters of the story. For a detailed overview, see this outside site (site also sells statues of the monkey king). Below is a small segment of the story written by Wayne Kreger of the University of Saskatchewan. Another site worth visiting is innerjourneytothewest.com by Walther Sell. It explores the inner meaning of Journey to the West. Mostly written in Chinese, but with some English resources. Numerous images. Link shows more photos. Japanese language only. In Chinese and Japanese artwork, the monkey is often shown riding the horse. This symbolism too stems from the classic Chinese story (see above) called Journey to the West, in which the Jade Emperor appoints the Monkey to the post of “Protector of Horses” to pacify the monkey’s desire for power and recognition. See parts of this story here (by Aaron Shepard, outside link). The monkey soon discovers that his posting as Stable Protector is empty (without real power or merit), and again returns to his mischievous ways, causing trouble for all until he is defeated by the Buddha. Photo courtesy of British Museum, where the scroll is kept. 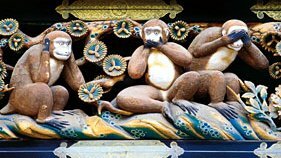 A famous carving of the three monkeys is found at the 17th-century Toshogu Shrine, a complex built to honor Tokugawa Ieyasu, the founder of the Tokugawa Shogunate (1603-1868 AD). The carving is located on the eaves of the Shinkyusha (Sacred Stable), again reflecting the monkey’s role as protector of the stables, a role that originated in the Chinese novel Journey to the West. Eight panels are carved on the wall of the shrine’s horse stable. The panel shown above depicts the three monkeys "hear no evil, speak no evil, and see no evil." Exact dates are hard to determine, but it was probably in Japan’s Edo Period (1603 - 1867 AD) that the Japanese began associating each of the 12 Chinese zodiac animals with one specific Buddhist patron deity, the Eight Buddhist Protector Deities. For reasons unknown to me, there are only eight patron Buddhist deities, not 12. LEARN MORE: Click here for details on the Eight Buddhist Patrons, or click here for details on Chinese Zodiac cosmology. Also visit the 12 Generals of Yakushi Nyorai for another grouping of Buddhist deities with the 12 Zodiac animals. Yakushi Nyorai is the Healing Buddha (the Medicine Buddha), and in the centuries following the introduction of Buddhism to Japan, Yakushi’s 12 generals became associated with the 12 animals of the Zodiac. In Japanese art, the 12 generals often appear with the 12 animals in their head pieces. There are variations in this latter grouping. Among some, the general Makora (also called Makura; Skt. = Mahoraga) is associated with the monkey. But at Kakuonji Temple in Kamakura, the general Anchira (Skt. = Andira) is associated with the monkey. Monkey mythology is an important part of both Hindu/Buddhist lore (India) and Zodiac/Buddhist lore (China). In the various tales presented above, the monkey was originally portrayed as foolish (India and China), vain (China), and mischievous (both). Yet, in each tradition, the monkey learns valuable lessons along the way, makes changes, and eventually gains redemption. The monkey thus embodies the themes of responsibility and devotion, and more importantly, the promise of salvation to all who sincerely seek it. This symbolism is still common in Buddhism as practiced today. In modern meditation practices in many Buddhist sects, one must first subdue the “monkey mind” before meditation can yield results. The goal is to overcome the restless monkey mindset, to stop jumping from branch to branch, to stop grabbing whatever fruit comes into sight, to stop being fooled by mere appearances. Salvation is within the grasp of all who seek it if they remain true, sincere, and dedicated. Copyright 1995 - 2015. Mark Schumacher. Email Mark.